Sends sequences in Flame to Shotgun Review. 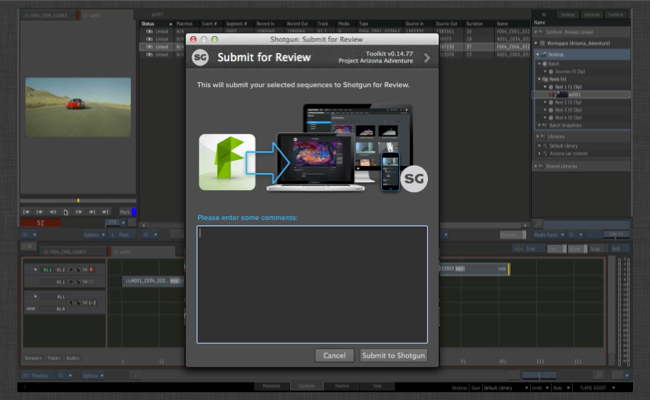 The Shotgun Flame Review App makes it easy to push one or more sequences from Flame into Shotgun review. The Sequence will be exported to disk as a quicktime. 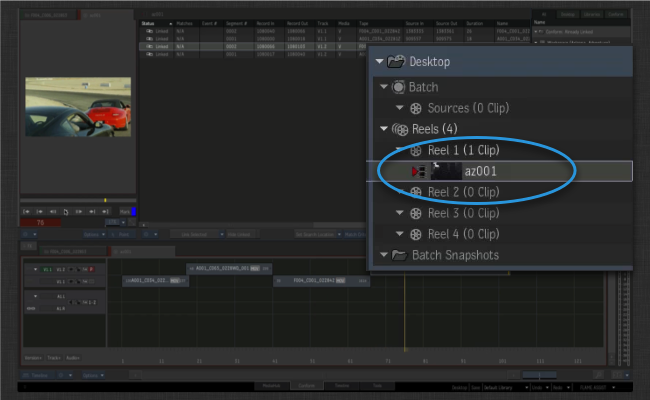 This export is handled as a Flame Quicktime export and you have complete control of the various settings via a configuration hook. Once the sequence is complete, Toolkit will check if there is a matching Sequence in Shotgun. If not, a Sequence will be created automatically. A review version will be generated and associated with the sequence. Lastly, the quicktime will be uploaded to the review version. 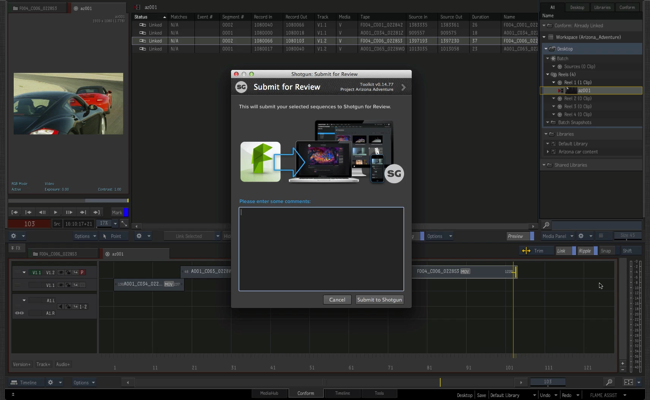 The process supports audio tracks, transitions etc and should be a "what you see is what you get". Once in Shotgun, you can review the media in many different ways, including the client review site and the Shotgun iPhone app. You can control which Entity Type that should be used in Shotgun to represent a Sequnce in Flame. 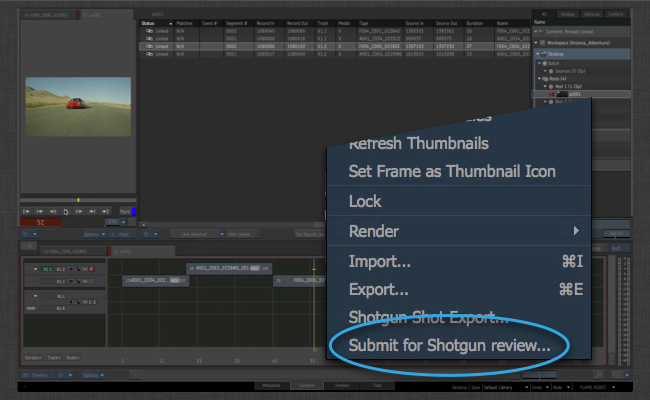 For example, if you are working on episodic content, it may make more sense to link your review versions to episodes in Shotgun rather than sequences. You can customize which tasks the app should automatically add to new items created in Shotgun. This is done via a task template setting and allows you to standardize the structure that's created. Via a hook, you get complete control over the xml preset that the app uses to generate a quicktime out of Flame. If you have access to the Shotgun Pipeline Toolkit, you also have access to the source code for all apps, engines and frameworks in Github where we store and manage them. Feel free to evolve these items; use them as a base for further independent development, make changes (and submit pull requests back to us!) or simply tinker with them to see how they have been built and how the toolkit works. You can access this code repository at https://github.com/shotgunsoftware/tk-flame-review. You need Engine version v1.14.3 or higher to use this. Description: The entity type in Shotgun to associate a Flame export with. Description: The Shotgun task template to assign to new shotgun entities or blank if none. Description: One line description of this profile. This will appear on the menu in Flame. Description: Contains logic to generate settings and presets for the Flame export profile used to generate the output. Description: Try to bypass the Shotgun server side transcoding if possible. This will only generate and upload a h264 quicktime and not a webm, meaning that playback will not be supported on firefox and no filmstrip thumbnails will be generated. The benefit of bypassing the transcoding is that the sequence is reviewable immediately after upload and the quality is significantly better. Description: Is the movie generation for the preview done in background with a job sent to Backburner or directly in foreground during the submission process. Minor adjustments to naming of backburner jobs. No longer shows preset compatibility warnings. Tweaks to the user interface based on feedback.